The man in the middle is Harley Baker, who lived in Cardin. 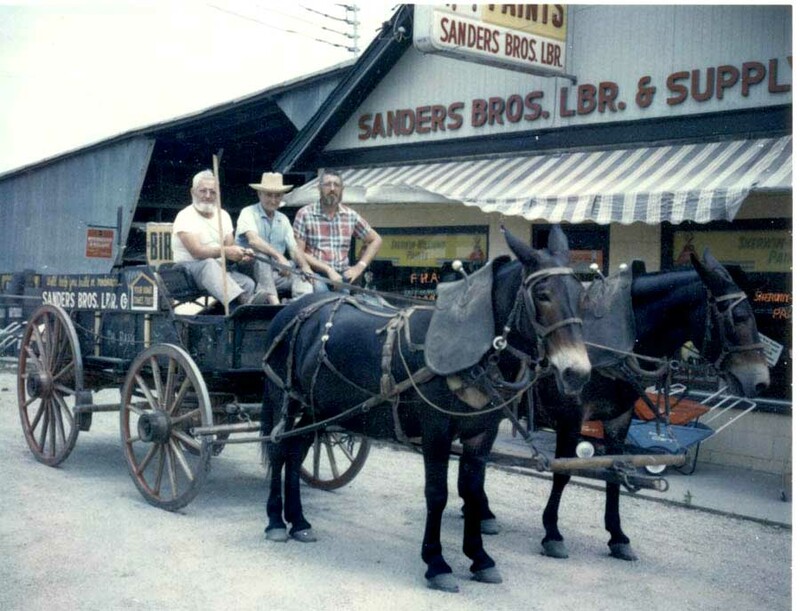 The other two probably worked at the Miami Store of Sanders Brothers Lumber. The wagon was donated to the Baxter Springs Museum by the Sanders family, and is currently on display in the basement, where the Picher (and other mining) display can be seen. Harley and those mules plowed gardens all over the area. When we lived up on the highway, we had an empty lot on the west side of the house, and mom, being raised on a farm, just had to make it into a garden. Of course, Bermuda grass was a constant fight, and she never did win that one. Any way, she would hire Harley to plow it every spring. After deciding that the harrow was really spreading the Bermuda, she decided to have him simply plow it one spring, and not harrow it. Let me tell you, by the time we got that sucker smoothed out, she had figured that was the wrong way to go about gardening. That turning plow can really leave a job to do.